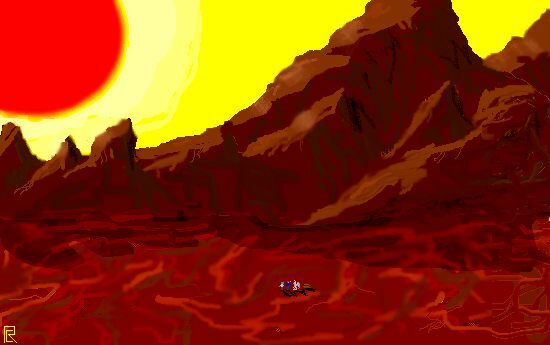 "Unusual weather we've been having..."
When the blaze of colors that usually comes with the dimensional hopping ceased, we found ourselves on a barren, rocky plain. The sky was somewhat reddish, and the sun hung in the sky far too close for comfort. I immediately started sweating. "Um, Aahz," I noted, "wasn't Chirosovo supposed to be cold?" Aahz waved a hand at me and started to look around. We both shed our coats as quickly as possible, giving little relief in the searing heat. "Aahz?" I continued. Aahz was looking at the D-Hopper in disgust. "Damn mechanical devices. They never work quite right. So I had one dial off. It would never happen with real magik." "Relax kid, the setting on this thing was wrong. Just one little change and we should be okay." "Grab your coat," Aahz said, as he pushed the button. Aahz jumped up and down, pressing the button again and again. I scanned for force lines, and got the bad news. There weren't any. Rather, there were, but they were so weak that I could hardly find them. "Aahz," I asked, "doesn't the D-Hopper depend on force lines to work?" "Of course it does," Aahz noted, angrily. "All magikal devices do." "Well," I noted, "that's probably why it doesn't work. No force lines." Aahz stared at me with what was perhaps the stupidest look I've ever seen him give me. He then threw his arms to the sky and screamed. Gus looked at Aahz. "Aahz, how could you mis-set the D-Hopper?" he asked, quite calmly. Aahz glared at Gus. "Hey, haven't you ever made a mistake before? Let's just think of a way out of this." "Aahz, it's not that," said Gus. "In the years that I've known you, you've always been very particular about things. You, quite frankly, do not make mistakes, at least not on that scale." Aahz fumed silently. "What are you saying, Gus?" I asked. "Somehow, I don't think Aahz made a mistake. I think this is Chirosovo." "What?" Aahz exclaimed. "Chirosovo's an ice world." Aahz nodded. "It has been a few hundred years..."
"Wait, wait, wait!" I screamed. "That makes no sense at all! Ginghe said Chirosovo was mountainous and frozen. Heck, even the guy on Gezirah that Gus met said that it was cold, and he knew someone working in the gas mines..."
"Well," Gus said, "I wouldn't put too much faith in that..."
Aahz peered up at the sky. "Could a gas mine explosion have caused this?" "Possibly," Gus remarked. "But it would have probably taken the entire dimension with it. But by the looks of it, something magikal helped. Or maybe it did it completely. Chirosovo was never magik-poor, at least not on this scale." "Great," Aahz continued. "We're on Chirosovo. Obviously, though, there's no labor strife because there's no labor to strife. But we've got to get out of here, and with the D-Hopper not working, we've got to figure some other means." "Like what?" I asked. "It's not as though there are any other magicians out there!" "First things first, kid. We need to get water. We need to get somewhere colder. And then we can start talking about getting out. Let's head toward those mountains. Go to the previous chapter. Return to the RLA page.